The spring harvest of alfalfa-grass mixes may account for up to half of the total forage yield of those crops for dairy farmers. The results of alfalfa-grass research funded by the farmer-driven Northern New York Agricultural Development Program may suggest a new option for dairy farmers looking to enhance forage production. The report is posted under Field Crops: Alfalfa at www.nnyagdev.org. Furthermore, Cherney notes that the combination of reduced-lignin alfalfa planted with meadow fescue, a winter-hardy grass species, can result in a large increase in neutral detergent fiber digestibility, a measure of the expected energy value that the forage will deliver to dairy cows. Higher digestibility value contributes to cow health and milk production. Forage quality of both grass and alfalfa can be improved by well-informed variety selection. The field trials at two farms in Jefferson County and one farm in Lewis County in 2016 and 2017 provided researchers, Extension field crop specialists, and farmers the opportunity to learn how new varieties of grass and alfalfa seed released by the seed industry will perform under Northern New York soils and climate. The trials also evaluated a meadow fescue variety developed by the USDA with reportedly higher digestibility than other meadow fescues. 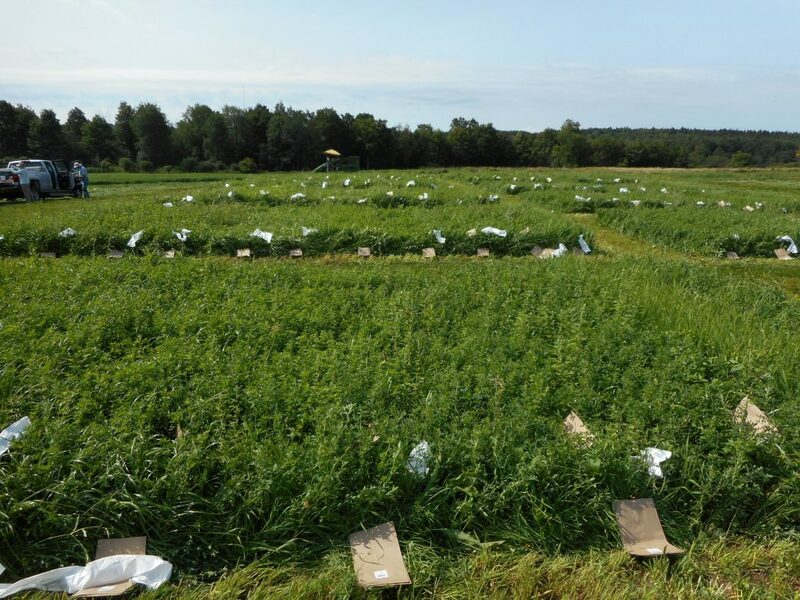 The plantings and evaluations conducted at the NNY farms produced data on yield and the quality of the alfalfa and of the grass grown in various mixes. The alfalfa and grass were analyzed separately for crude protein, fiber, digestibility and lignin values. 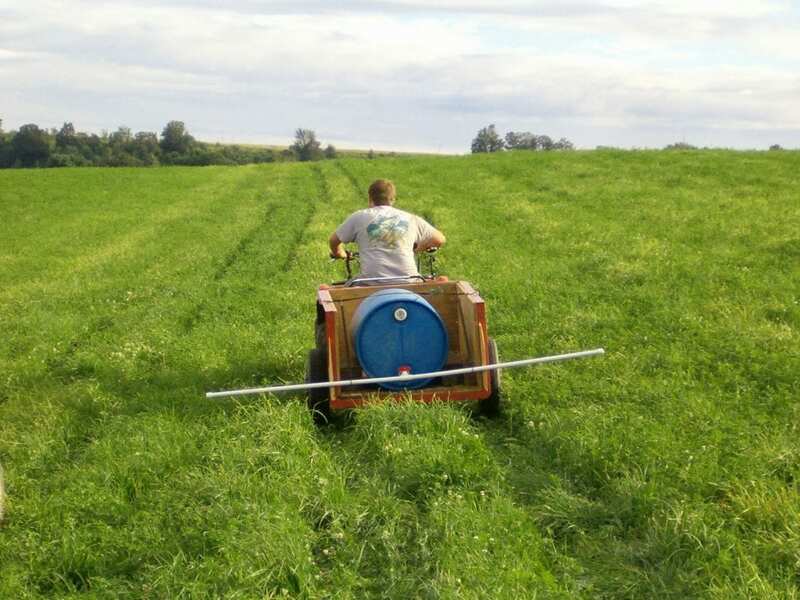 With a 2018 grant from the Northern New York Agricultural Development Program, the Cornell team will evaluate an alfalfa-grass mixed seeding with timothy established in 2017 in Lewis County, along with seven grasses and three alfalfa varieties there. The regional research in 2018 will also include testing meadow fescue at several seeding rates in plantings with alfalfa, and the addition of a new variety of meadow fescue that looked very promising in 2017. 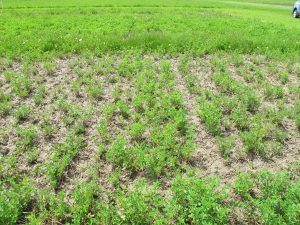 Throughout the 2018 spring season, Cornell Cooperative Extension Field Crops Specialists provide weekly updates to alert Northern New York farmers for optimal harvest timing for the first cutting of their alfalfa-grass forage crops. Fiber digestibility declines more than one percentage unit per day in spring growth making optimal harvesting of alfalfa-grass crops a key component of good production management. Funding for the farmer-driven Northern New York Agricultural Development Program is supported by the New York State Senate and administered by the New York State Department of Agriculture and Markets.The spring harvest of alfalfa-grass mixes may account for up to half of the total forage yield of those crops for dairy farmers. The results of alfalfa-grass research funded by the farmer-driven Northern New York Agricultural Development Program may suggest a new option for dairy farmers looking to enhance forage production. 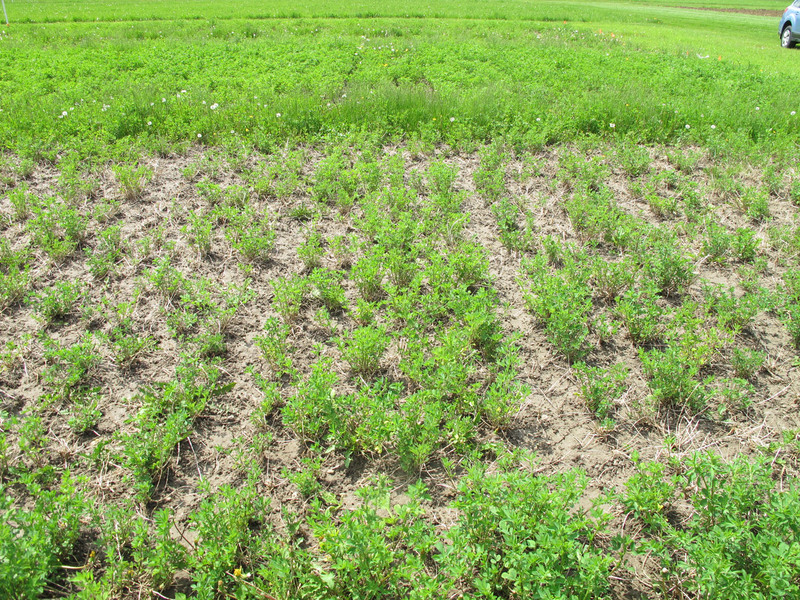 The report is posted under Field Crops: Alfalfa at www.nnyagdev.org. Funding for the farmer-driven Northern New York Agricultural Development Program is supported by the New York State Senate and administered by the New York State Department of Agriculture and Markets. Opportunities to boost spring hay crop silage yield and quality were evaluated in research funded by the farmer-driven Northern New York Agricultural Development Program. The results of regional on-farm trials with winter rye and triticale in 2016 and 2017 by the W.H. Miner Agricultural Research Institute in Chazy, NY, are now posted at www.nnyagdev.org. Winter forage crops contribute to soil conservation and can improve soil quality when following a corn silage crop. “Our evaluation showed that winter rye and triticale can be established as winter forage crops planted in a field after corn silage harvest in Northern New York with economical yields and high quality for harvest as hay crop silage, and these winter forages can be successfully double cropped with corn silage, giving farmers another crop production risk management strategy,” said project leader and Miner Institute Research Agronomist Eric Young. Triticale was successfully established using no-till methods after termination of an alfalfa-grass field. Future research will help determine the best methods for winter forage crop establishment across varying soil conditions. Growing winter forage crops for spring harvest as hay for dairy cows and livestock is becoming increasingly popular, but weather can challenge yield and successful retention of crop nutrients. A complete report, including evaluation of the winter forage crops for dry matter yield, crude protein, water soluble carbohydrates, fiber digestibility, and phosphorus, potassium and lignin content, is posted on the Northern New York Agricultural Development Program at www.nnyagdev.org. Comments Off on Are you prepared to change your routine this spring? Are you prepared to change your routine this spring? While spring tasks vary by farm, there are many “rites of spring,” and they are often completed in a fairly rigid sequence. Depending on the farm, these often include fixing fence, spreading manure, planting new seedings, planting corn and harvesting first cutting, and are often performed in this order. We are optimistic that the upcoming turn in weather will allow these tasks to be accomplished in a timely manner, but at this point it is time to ask yourself: Are you willing to change your spring routine? In addition to adverse weather it is no secret that everyone is facing extremely tight economic times, and dealing with forage inventories of poor digestibility forages from 2017. This combination of factors makes it more critical than ever to be ready to tackle the task that will have the most impact on your business at the proper time. The number one focus should be on timely harvest of first cutting. Park the corn planter when a field of first cutting is ready for harvest. Approach harvest by the acre, not by the field. Be ready to skip over a field that has passed its optimum harvest stage. Strategically plan feed storage to best utilize forage inventories for the right group of animals. The window for planting for silage is generally wider than for grain, which is why first cutting can and should take priority over corn planting. However, in the event of extreme delays in planting corn, performance will diminish with late plantings. If corn planting progresses into late May or early June, begin to consider alternative options for those acres. 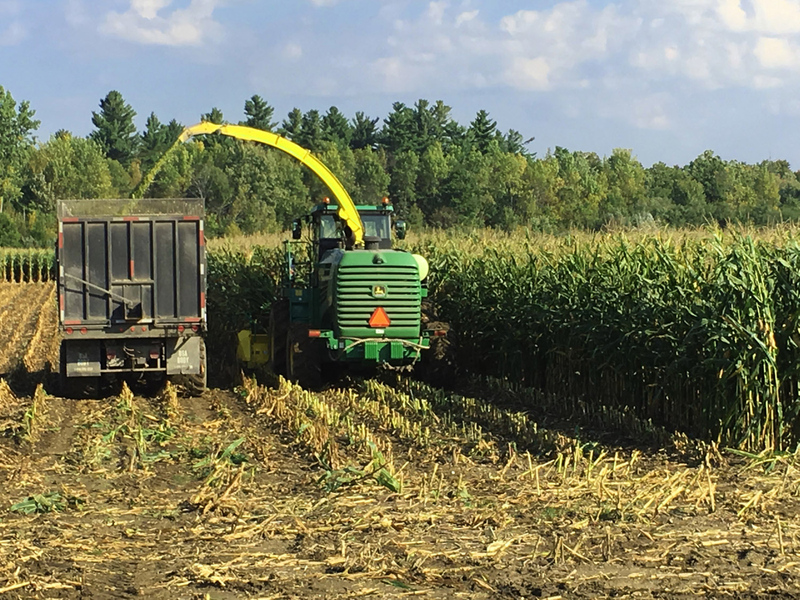 Previous research from Cornell and Penn State suggest a 0.5 to 1 ton/acre per week decline in silage yield for planting after mid to late May. First and foremost during a time of year that can be very busy and stressful, taking every precaution to keep your team safe is critical. The idea of fitting all of this work into a condensed time period, and still getting key tasks completed before critical deadlines can seem impossible, but year after year many find unique ways to get it all done. Consider working with neighbors, custom operators or renting equipment to accomplish these key tasks on time. If you currently utilize custom operators, now is a good time to set up a time to meet with them and make sure you are on the same page to get tasks accomplished in the time-frame needed. Make sure that your expectations and goals are clearly defined. They will also be under stress to fit their work into a condensed period and meet their customers’ expectations, so defining expectations and pre-planning how to most efficiently get the work accomplished when the custom operator arrives can go a long way to increase the chances for success. Chazy, N.Y. 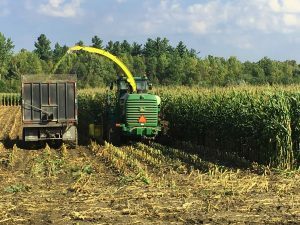 The 2017 corn harvest in Northern New York is providing data to researchers with a grant from the farmer-driven Northern New York Agricultural Development Program to compare forage quality and yield between two distinct types of corn. ‘We are interested to see if yields for the 2017 crop will continue to show no consistent difference between the BMR and non-BMR hybrids grown for silage,’ said project leader Eric O. Young, research agronomist at the William H. Miner Agricultural Research Institute, Chazy, N.Y.
‘In our regional trials to date the BMR hybrids have had a distinct advantage in fiber digestibility and therefore milk production potential,’ Young added. Brown MidRib, or BMR, corn has a naturally-occurring genetic variation that produces higher fiber digestibility that, in turn, increases the milk production potential of dairy cows. However, farmers are concerned that BMR corn may not yield as well as non-BMR corn hybrids. ‘Until this project funded by the Northern New York Agricultural Development Program there has been relatively little research evaluating performance among brown midrib hybrids and non-BMR hybrids with respect to yield and forage quality,’ Young noted. The research in Northern NY includes commercially-available BMR hybrids currently on the market. Data from the 2017 harvest will be compared with trial results with five corn hybrids grown at two farm sites in 2015 and 2016. Crop samples were evaluated for yield, digestibility, percent dry matter, acidity, starch and other components, silage fermentation and quality after harvest. This research provides a data foundation for analyzing the potential milk production impact of using BMR and non-BMR hybrids in the dairy cow total mixed ration. The 2015 and 2016 NNY BMR evaluation reports are posted on the Northern New York Agricultural Development Program website at www.nnyagdev.org. The Northern New York Agricultural Development Program funds agricultural research and technical assistance in Clinton, Essex, Franklin, Jefferson, Lewis and St. Lawrence counties. Funding for the Northern New York Agricultural Development Program is supported by the New York State Senate and administered by the New York State Department of Agriculture and Markets. 5 Pest Records help with the future! Advice for a difficult crop year. The current 2017 wet/rainy weather and high humidity can create a situation where diseases can become an issue in corn. While there are several foliar diseases that can occur on corn under these conditions, gray leaf spot and northern corn leaf blight have been especially problematic over the last several years. 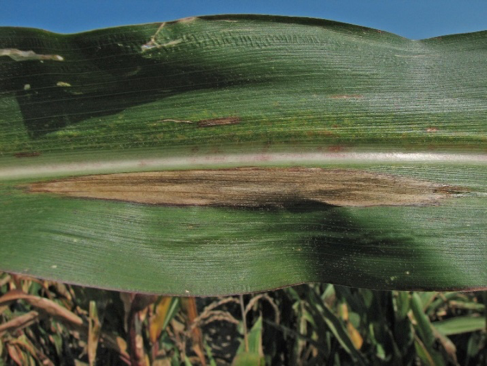 Gray leaf spot and northern corn leaf blight can cause yield losses and the risk of infection may be an issue this year. What should a grower do about it? While applying protective fungicides is an option, there are several things to consider before spraying. Here are a few steps to follow when making a decision. Scout fields for the gray leaf spot and northern corn leaf blight at tasseling. 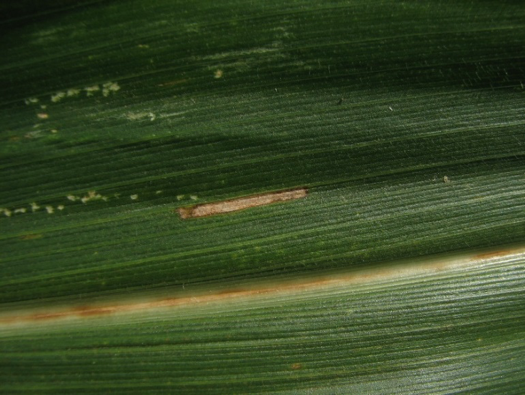 If there are lesions on leaves at or above the corn ear exceeding 5% of the plant leaf area consider a fungicide. If lesions develop later after tasseling, then economic benefits from using a fungicide will be less. Does your hybrid have at least moderate resistance? This can make a big difference in yield and likely will not require a fungicide application. Disease symptoms may be present in resistant corn, but a fungicide most likely will not increase yield. Crop rotation and tillage is an effective method to control the fungi. The longer the rotation the less inoculum will be on the surface. If you maintain no-tillage, zone-tillage or reduced tillage rotating away from corn for 2 years can help reduce pathogen populations. Fungicides can be very effective when disease exists above the economic threshold. However, fungicides are protective not curative, so applications need to be made before the full extent of disease damage is known. It is generally not economical to spray fungicide on silage corn. Early symptoms are yellow to tan lesions with a faint watery halo. As the lesion progresses, it turns brown and is rectangular in shape, between the veins. When fully developed the lesion can be 3 to 4 inches long and a 1/6 to 1/8 inch wide. The fungus can overwinter on corn debris left on the soil surface. Sporulation occurs during warm and humid weather in late spring. The spores can be transmitted by both wind and rain. In some cases gray leaf spot can reduce corn yields from 5 to 40 bushels per acre. The symptoms are long, cigar-shaped lesions that are about a 1/8 to ¼ inch wide. The lesions can be many inches long. Lesions are grayish-tan and have a pigmented border. There are numerous races of the pathogen, some of which overcome resistance genes deployed in many of the corn varieties grown in NY. The fungus overwinters on corn crop residue from previous years. Certain fungicides now carry a label for plant health benefits when used at the V4-5 stage and, if warranted, again at tasseling. Product labels suggest potential yield and quality benefits from their use. Cornell University is conducting field evaluations to better understand the economic returns of using fungicides in this manner. There are numerous factors affecting the forage quality of corn silage. Major factors on overall quality include whole plant maturity at harvest, ear to stover ratio and seasonal weather patterns. A healthy plant with minimal damage to plant tissue is able to mature to desired corn silage dry matter content in a more efficient and timely manner. It is extremely difficult to predict the chances of mycotoxin issues in silage. It is important to recognize that mycotoxins only develop on living plant tissue and therefore the necrotic tissue resulting from leaf diseases are not an indicator of potential mycotoxin risk. Plant injury to living tissue, where mycotoxins can develop, such as feeding damage on the ears and stalk do offer a pathway for disease organisms and moisture to get into the plant and wet conditions late in the growing season can increase the chances of mold development. Again it is very important to understand there is not a clear causal relationship, even when an ear or stalk mold is present it is not a sure indication that mycotoxins will develop. It is important to work with your nutrition consultant at harvest to test for potential mycotoxin issues. This week’s Ag Report will just be this post. I was in Utah last week for the National Association of Agricultural Agents. At the tradeshow, they had a “steam generating machine” between the tractor and baler. Out there they have to add moisture to bale alfalfa so it does not crumble from the dryness. What a contrast to our situation this year! This week I scouted corn for diseases, as part of our fungicide trial. All the plots were clean. There was one report of armyworm last week. Check all corn, grass, pastures, and small grain fields for armyworm. There are spotty infestations in eastern NY. If grasses do not regrow like normal, check for armyworm eating all the re-growth. Spring barley is ripening, but not yet ready for harvest. The more I learn about malting barley, the more I realize how tricky this crop can be. Despite our weather, I have seen no head blight – thanks to timely fungicide applications. Potato leafhopper have been severe since before I left. Check alfalfa fields. Adult PLH will migrate to a different field when alfalfa or clover is harvested. Keep an eye on adjacent fields. I am not sure what advice to give to dry hay growers. Beef and horse owners are in tough shape since all their hay is still in the field. Consider having uncut fields harvested for haylage and put in a pile or made into baleage. If properly fermented, horses can eat haylage, but if the fermentation is bad, they can be quite sensitive. It is a slight risk. Also, a machine called the Macerator conditions haycrop after mowing. It is basically a roller mill that speeds drying. However, it also softens coarse hay. So, if we do get any good hay weather, this would be a good machine to use on rank hay. I only know of one in our area.